It was over a year ago that I first contemplated going on this trip. My friend Andy had been talking about his annual canyoneering trip and it sounded like lots of fun. Unfortunately, or fortunately as it turned out, the trip was the week I was getting back from Yellowstone. In retrospect, I am very glad I waited a year to go on this trip. Since then I have taken up climbing and have learned the rope skills necessary to be comfortable doing this sort of thing. That, along with a few Saturday trips to cliff drive to practice rappelling and ascending and I was ready. The trip pushed me physically at times, but nothing like some of the backpacking trips I took in scouts as a kid. It did, however, push me mentally. I did things on this trip that I wouldn't have thought I could do a year ago. Though I was nervous I never felt scared. I had a confidence in my abilities and knew that I had no other choice to continue as there was no way out but down. Behunin specifically helped me to grow. At times I was questioning what I was doing, but I'd go back tomorrow and do it again if I could...maybe next year. We left Kansas City on Friday June 1st, 2012 after work. A (relatively) short and uneventful drive through Western Kansas took us to Colby for the night. Saturday was a very enjoyable drive through the Rockies and into Utah. 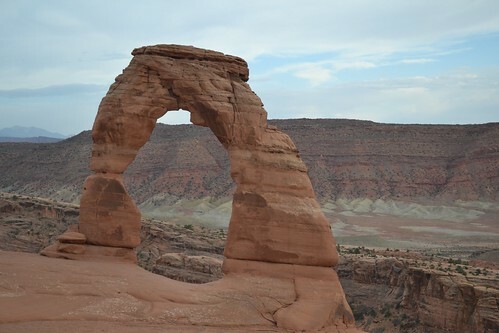 We took a detour and followed the river to Arches National Park for a nice hike to Delicate Arch before spending the night in Green River. Sunday, after an excellent breakfast, we began our drive to Zion. The drive was gorgeous! 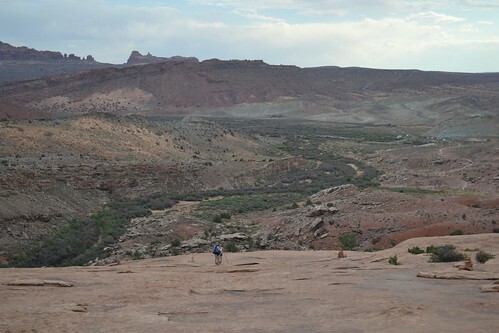 Especially going through the San Rafael Swell and the drive down 89 along the river. We arrived in the park from the East and headed through the tunnel and down to the visitor's center. We checked in at the backcountry desk and got our permits for the next two days before filling up our water bottles with water. Soon after, Andy's friend Brian and his son Keelin showed up and we were off to Pine Creek. Pine Creek is the quintessential canyon for beginners, which is exactly what I needed! The first rappels are short and were good for getting some practice. It was hot but once in the canyon out of the sun it became pleasant. The water, however, was a different story. Except for the first few pools the water is not in the sun. I would not recommend doing this canyon without a wetsuit, even on a blistering day, as the water is very cold. We quickly ran into another group and had to wait for them to move on before we could keep going, but by the time we got down the Cathedral rappel they had gotten well ahead of us and we could move unimpeded. The most unpleasant part of the canyon was the fact that a goat had fallen in and his presence could be smelled, though thankfully not seen. We caught up to the group again on the second to last rappel. They were rappelling on a Petzl Nomad climbing rope, which was very bouncy. This is a great climbing rope, in fact I had just bought one, however, when canyoneering you typically want to use a static rope that does not stretch. Knowing this, and knowing what the last rappel was like, Andy volunteered to go ahead and set up the last rappel if they would let us "play through" on their rope. They caught up quickly and soon we were one group finishing the canyon together. The hike out was brutal. We spent over an hour scrambling down the boulders in the watercourse. We finally reached the switchback of the road at 8:45...15 minutes before sunset! It had been a long day but we had made new friends and had a wonderful time! By the time we made it back to Springdale most of the restaurants were closing. We tried Oscars but were turned away. We ended up having a nice meal at Wildcat Willies. Monday brought the biggest adventure of the trip! The night before I was not sure if I would be participating on Monday as my ankle had been hurting from Pine Creek, and I was not looking forward to the approach hike with 2000 feet of elevation gain. I figured I would start out, and turn back if necessary. Both the park and Springdale have an excellent free bus service so I could easily return to the hotel. Rather than shuttling cars as we had the day before, we rode the park bus from the visitor's center to The Grotto stop. A short hike across the river led us to the Angel's Landing Trail and up we went. The switchbacks were nothing spectacular, but once we got to the top and entered Refrigerator Canyon the view of the main valley was breathtaking! A pleasant hike up the canyon in the shade led us to Walter's Wiggles and we were soon at the turn off for Angel's Landing. While most people were heading up to Angel's Landing we continued on up the West Rim Trail. We continued upward until topping out on some slickrock. We had a brief descent to a nice bridge where we had lunch in the shade and then it was back uphill to the top of the canyon. 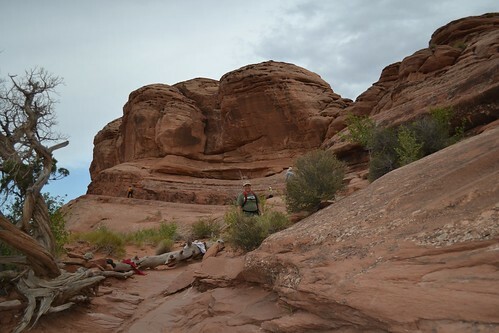 The "drop in" is a steep patch of slickrock that you rely on the stick rubber of your shoes to get down. After hiking for 30-45 minutes you come upon the first anchor. The first anchor is sketchy. Not the anchor itself, but getting to it. It is 30ft out on a ledge that is anywhere from 4" to 18" wide. You step over a bush and go under a tree. All this while unprotected. Sure, you could belay someone, but if they fall they are just going to pendulum anyway...not much point. This was the first big mental challenge of the day. Thankfully I passed! Once on the anchor you have a breathtaking view of the real "drop in." Four rappels drop you 510 feet into the canyon. They are spectacular and well worth the effort to get to! Once in the bottom there is a bit amount of hiking through a dry creek bed until you reach a relatively short and very nice 90ft drop. More hiking leads to a fluted rappel of of a rotting log into a pool of very cold and skanky water! 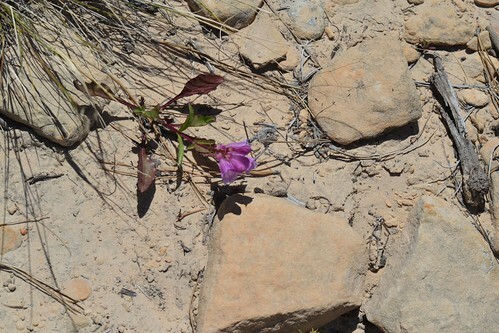 On more winding rap and some hiking and you are near the end. The end of this canyon is not for the faint of heart! It didn't help that I had been hearing stories about how bad it was getting to the anchor! As you slide down a boulder the exit of the canyon comes into view. As you climb up to the right of a large boulder you realize that you are about 300ft above the boulder field below and 500ft above the river. Andy had climbed down to the anchor and Brian was handing him the ropes...and blocking my view. The wind was gusting as I sat there waiting. What I imagined in my head was far worse that what it actually was. Turned out to be an easy 5.6 down climb to the ledge. That being said, it wouldn't hurt to belay down to this anchor. The rappel itself was no big deal once on the anchor. The next rappel is immediately following the last after a short down climb into a hole. This was the single most dramatic rappel of the entire trip. The first 65 ft or so of the rappel are against the rock. The last 100 ft are "free", or hanging in the air. This alone is intimidating for someone new to canyoneering, but with the wind blowing it made it all the more "fun." As nervous as I was the view was incredible and I wouldn't have missed it! Once at the bottom a short hike brings you to the Emerald Pools. 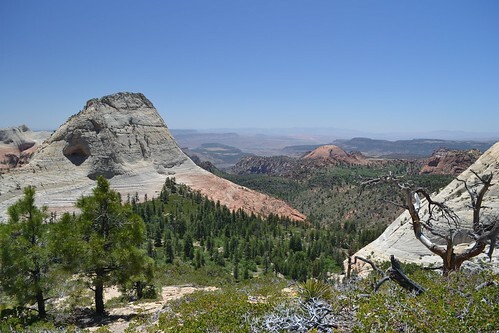 Unfortunately they were doing trail work and the shortest trail back to the busses (at Zion Lodge) was closed. We had to hike back to The Grotto and by the time we crossed the river it was dark. It was 11 hours after we had started and we were all exhausted. We were a bit worried that we had missed the last bust because it was several miles back to the visitor's center. Fortunately there were still a couple busses running and we were able to make it back. Knowing most of the restaurants were closed we headed to the Bit and Spur as we knew it was open late. Turns out the food is excellent! Their enchiladas are amazing!! Tuesday was Mystery Canyon. Now I was extremely tired, but we had "won" this permit in the lottery and it is very hard to come by...I would hate to miss it. I had read the description and the only concern I had was getting a belay out to the anchor on the mystery springs rappel. Andy had agreed (though turns out there is webbing in place) and we were off. Took a car up to the East side and hiked along the East RimTrail to the drop-in. Now this truely was a "drop-in!" The beginning of Mystery Canyon is called Death Gully, and for good reason. You start out walking on a "trail" sideways on a scree slope and quickly find yourself clambering down an erosion trail holding tree branches and roots to keep from sliding to the bottom. After what seems liek an eternity of this you reach a point where it is only mildly steep and you begin to encounter "obstacles." The obstacles consist of some downclimbs, short rappels, and walk-arounds. After bypassing these you finally reach the section where the canyon becomes "narrowes" and the real rappels begin. These rappels are narrow, fluted, and beautiful! There are sandy areas at the bottom of several raps that provides a nice shady spot for resting and a cool break from the sun. After the first section of narrows things open back up into the sun and a bit of hiking takes you to the "lake." Though usually dry, the lake was formed by a giant rock/sand slide sometime in the 1970's. This creates an obstacle of a 70ft tall "mountain" blocking the canyon that must be hiked over in order to continue. Past the "mountain" a singel rap, some down climbing, and some hiking, all in full sun, lead to the Mystery Springs Rappel. The Mystery Springs Rappel is a 110 ft drop down a nearly vertical wall. The rap anchor is well out on a ledge, but is protected off another bolt with a length of webbing for clipping a tether into. This is one of the more beautiful spots in the Canyon and a great place to stop for a snack in the shade before continuing on. Though I had done longer raps the previous day this was the first "long" one of the day. The ledge made me a bit nervous, but having the tether really helped to alleviate my fear. The rap itself was very enjoyable. 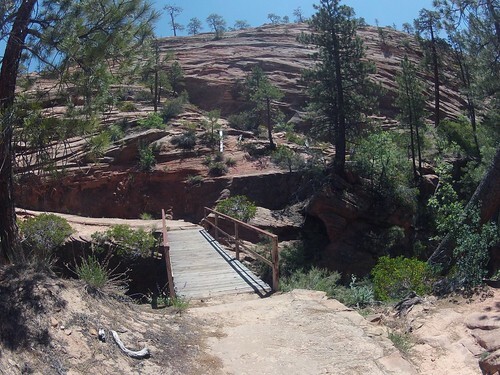 Once down Mysetery Springs there is a fair amount of hiking through a beautiful, damp section of the canyon. We encountered only one obstacle that can be either downclimbed or rappeled. We chose to rap because of the running water and were soon on our way to the best rap of the trip! The rap into The Narrows from Mystery Canyon is one of the most gorgeous and enjoyable raps in the park. The narrows is usually full of tourists out for a challenging day hike, therefore, an audience is to be expected. As we popped our head over the edge we were soon noticed and a group gathered to watch us come down. The rap follows a waterfall down a nearly vertical face for 120 ft into the Virgin River. Because of the waterfall and the moss growing on the rock.this rap is very slippery. With all the onlookers there is even more pressure not to slip! Once at the bottom you find yourself surrounded by the beauty of The Narrows. Now, all the canyones I was in during the trip were incredibly beautiful, but I have to say none compare to the (relativley) easily accessible Narrows. Now I do have a thing for rivers...especially rocky mountain ones, so that might make me a bit bais. However, the color of the high walls, the flowing river, and the green trees along the sandy banks all contribute to the stunning beauty of this place. The hike out was very enjoyable and did not seem at all like work. We caught the shuttle back to the visitor's center where we got Brian's car and went to retreive Andy's from the East side. We again opted for The Bit and Spur for our dinner before returning to the hotel for a well deserved rest. Wednesday was to be Englestead, but we were beat! I feel bad for Andy because he had really been looking forward to this one. It has a rappel of nearly 300 ft at the start. I was not sure I was up for that and neither was Brian and Keelin. So, we took a rest day. We gave back our permit for both Englestead and Spry and got a new permit for Orderville. I spent the morning in the park checking out The Emerald Pools and Weeping Rock before joining Brian and Keelin for a float down the Virgin River. The Water was low but it was still fun. Andy spent the day hiking up to the Northgate Peaks. We met up for dinner with Tom Jones at the Whiptail Grill. Tome is the local authority on Canyoneering and quite literally wrote the guidbook. If you are at all interested in canyoneering you should check out his site www.canyoneeringusa.com. Tome had some good stories and we all enjoyed a nice meal before getting some much needed rest. Thursday we drove back up to the East side and hiked down the 4WD road to the start of Orderville Canyon. 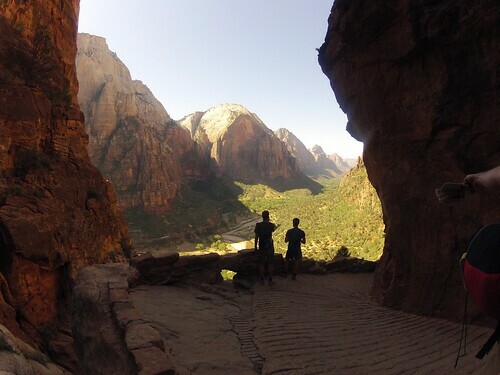 Orderville is "the easiest technical canyon in Zion, or the hardest off-trail hike." This day was all about enjoying the scenery and water in the "Orderville Water Park." 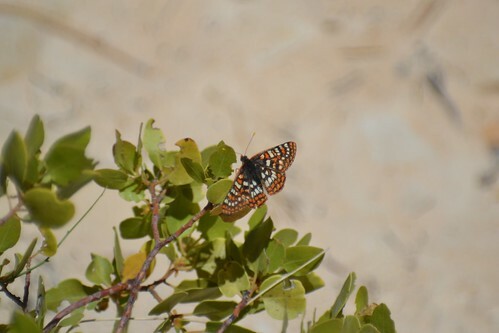 Most of the day consisted of hiking down a dry creek bed, alternating between shade and sun. 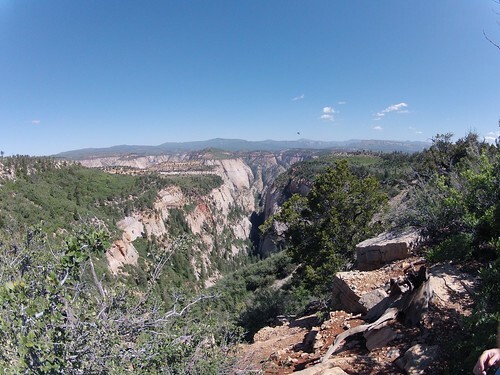 This canyon only has two rappels, and the longest is only 15ft. Around halfway through we encountered a massive logjam with water on the other side. From that point on we were hiking in a wet creek bed, though the stream was small. The second rappel is called "The Guillotine" because of the large angled boulder ominously suspended overhead. After this rap the water starts getting deeper and the canyon narrower. There are several down climbs, usually through waterfalls into deep, cold pools of water. We came to on drop into a particularly skanky pool of water with a large log jamb on the other side. There were a couple other groups that were climbing up a side trail and rapping. I opted for this route while the rest of the group decided to take the more direct route. I was going to rap with the second group but they were talking about setting up a hand lien to get down to the anchor and I knew it was going to take a while. I decided to down climb to the anchor (a bit sketchy) and was able to "play through" just before the first group pulled their rope. A bit more hiking led us back to The Narrows. This hike out was just as beautiful as hiking out from Mystery, there was just more of it! Orderville is an excellent canyon for someone looking for an adventure without much previous experience. I think Orderville followed by Pine Creek with an experienced guide would be a great introduction to canyoneering for anyone. After a shuttle ride back to the visitor's center we once again went after Andy's car. We were tired after a 12.3 mile day, but not nearly as tired as some of the previous days. We had a nice dinner at Oscars before turning in. Friday was another "rest day" which seemed odd given we were going home the next day. However, Andy and I did not do much resting as he wanted to hike back up to the Northgate Peaks. We spent the day exploring the West side and bagged a (small) summit. Got some great video and pictures from up there and got a good feel for where The Subway and other West side canyons were. Brian and Keelin spent the day relaxing and shopping before meeting us for one final hike up the Canyon Overlook Trail before one final meal a the Bit and Spur. Saturday we met for one last breakfast at the Mean Bean before hitting the road. 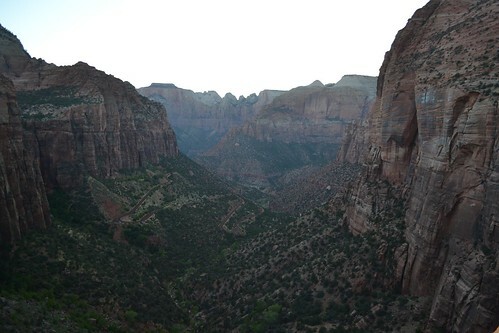 Andy and I stopped at the West Entrance of Zion for a brief overlook before heading on to Golden, CO for the night. Sunday we made the rest of the uneventful drive home. As always, it is bittersweet coming home. Great to see the family but hard to go back to the daily grind after such an adventure! This trip was not only a fun adventure, but it helped me push my limits and grow as a person. Over the previous year I had become a climber and had begun to learn some basic rope skills. In preparing for this trip I learned how to rappel, tie off on rappel, and ascend a rope. I realize that I really jumped into the deep end with this trip, especially Behunin! Though it is listed as a moderate technical canyon the sheer lengths of some of the raps and the conditions getting to some of the anchors made it a real learning experience. I came home more excited than ever to continue to push my limits and search out even greater adventure. So, until the next trip I will continue to improve my sport climbing skills and rope work skills (I'll definitely start rapping down from the anchors instead of being lowered). I also think I will purchase a basic trad rack and begin to practice on some easy routes in Arkansas. Rather than focusing on pushing the difficulty of the routes I am doing I am looking towards multi-pitch climbing as my next step. I think it will be a better rout to getting out into the wilderness and enjoying the benefits that come with it. Grand Teton here I come!